Lightly powdered for easy on and off. One size fits all. Fits either hand. Applications: General Cleaning, Pet Messes, Automotive, Painting, Woodworking, Hair Coloring, & Gardening. Color: Opaque Cream. 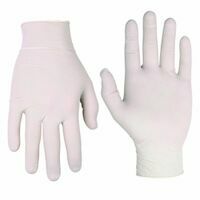 Vinyl gloves offer lightweight protection and are great for those with latex allergies; lightly powdered, reusable and economical. One size fits all and either hand. Disposable nitrile gloves. Seamless and reversible with rolled cuff. 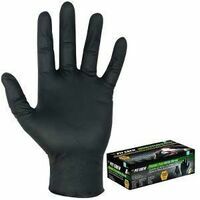 CLC Disposable Gloves, Industrial Grade, Pre-Powdered, One Size Fits All, Nitrile, Blue, Rolled Cuff, 4 mil Thickness Soft and durable gloves offer medium weight protection and more puncture resistant than latex; powder free; contains no natural latex; ideal for painting, cleaning and automotive jobs; highly resistant to alcohol and petroleum based products. Size: Large/X-Large. Use for painting, adhesives, gardening, household, food prep or automotive. One size fits all. Blue nitrile disposable gloves; boxed. 4 mil. industrial grade with rolled wrist. 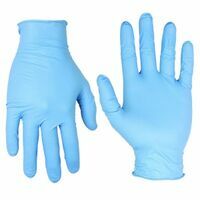 CLC Disposable Gloves, Industrial Grade, Pre-Powdered, Series: 2320, Small, Nitrile, Blue, Rolled Cuff, 4 mil Thickness Powdered vinyl general grade. 4 mil, 10" long. CLC Disposable Gloves, Industrial Grade, Pre-Powdered, Series: 2316, X-Large, Latex, White, Rolled Cuff, 5 mil Thickness, Resists: Water Opaque vinyl disposable gloves; boxed. 5 mil. industrial grade with rolled wrist. Blue nitrile disposable gloves; boxed. 4 mil. industrial grade with rolled wrist. Opaque vinyl disposable gloves; boxed. 5 mil. industrial grade with rolled wrist. Seamless for better wear and tactility; resistant to many liquids and cleansers. Excellent dexterity and tactile sensitivity. Rolled cuff for easy removal. White, lightly powdered. Use for painting, adhesives, gardening, household, food prep or automotive. One size fits all. 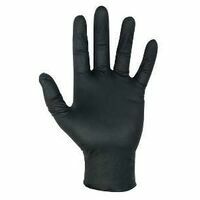 CLC Disposable Gloves, Powder-Free, Series: 2337, Large, Nitrile, Black, Rolled Cuff, 6 mil Thickness, Resists: Abrasion and Puncture, Textured CLC Disposable Gloves, Powder-Free, Series: 2337, X-Large, Nitrile, Black, Rolled Cuff, 6 mil Thickness, Resists: Abrasion and Puncture, Textured Soft and durable gloves offer medium weight protection and more puncture resistant than latex; powder free; contains no natural latex; ideal for painting, cleaning and automotive jobs; highly resistant to alcohol and petroleum based products. Size: Large/X-Large.